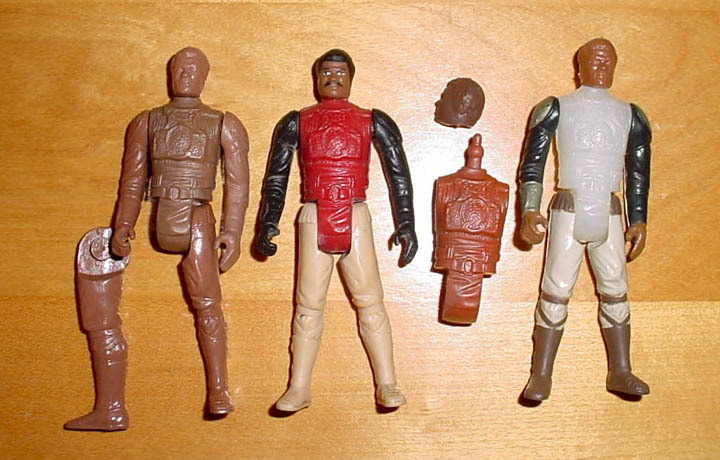 What we have here are a number of Lando Calrissian (Skiff Guard Disguise) first shots. In the first picture we see a number of different early first shots. The first is an all brown first shot. The next is a hand-glued red first shot. Only the head is painted on this piece. The next is a maroon head pull test. Sadly, the back is missing from this piece. The final piece is a clear head pull test. It is worth noting that legs on this piece are production and only used for display purposes. The 2nd image has some first shots from a little later in the production process. The first is a production color unpainted firstshot. The next is one with only an unpainted head. The 3rd is one with unpainted legs. This one has become a bit of a celebrity first shot since a similar one is featured on the back of the 77 back. Provenance is key with a piece like this since it's a fairly easy to fake piece so never buy one unless it comes from a reputable source. The final is one of the pieces that turned up from the Lily Ledy factory find a number of years ago. The piece is unwelded and completely unpainted except for the eyes. 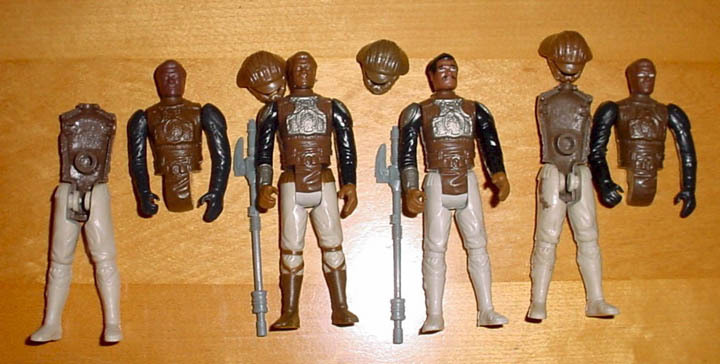 The final image shown is a group shot of several stages in the production process of the Kenner, Lily Ledy, and Top Toys Lando Calrissian (Skiff Guard Disguise) action figure. 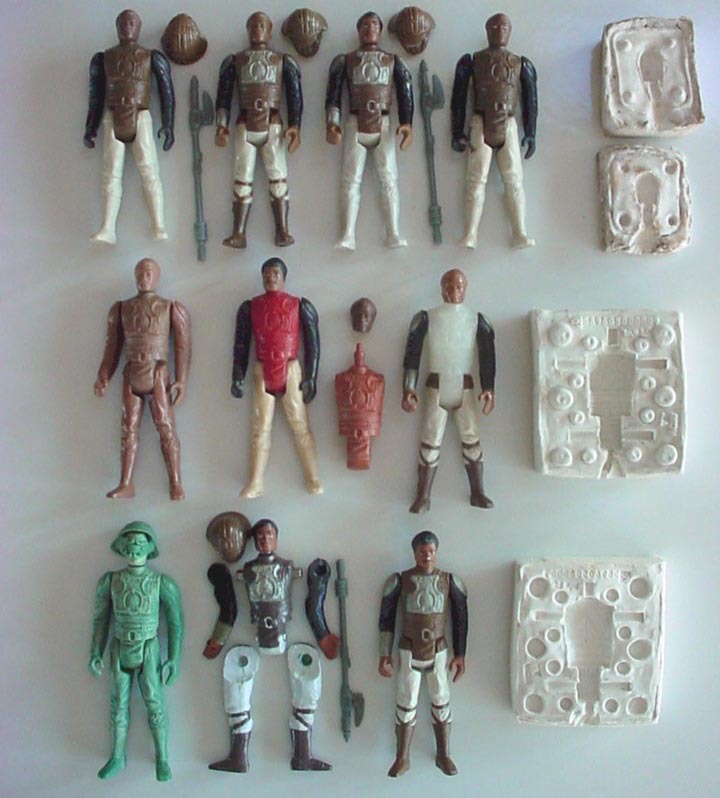 The image includes several early and late first shots, an unpainted Kenner hardcopy, a painted Top Toys hardcopy, a painted Kenner protomolded figure, and the head and torso silicone molds for the Top Toys hardcopy. Make no mistake a run like this is not easy to assemble and I'd like to thank David for sharing images of this marvelous view into the creation of Lando Skiff.